La Vie Est Belle / Life is Beautiful ushers in a new pop force. Yannick Ilunga has positioned himself as the frontman of a new genre: noirwave. This isn’t quite in the same league as Vaporwave, Seapunk, or any other such internet spawned and shaped sound. Instead, Ilunga has trademarked Noirwave to pose himself as peerless. The mixture of South African roots and 80s synth pop certainly is a novel enough mixture, but it’s Ilunga’s own innate talent that truly pushes his persona past his contemporaries. 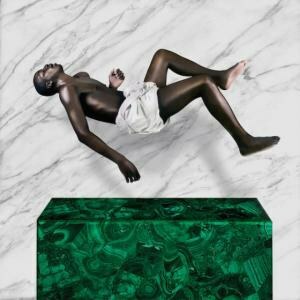 Ilunga’s Petite Noir project first gained “next big thing” buzz when he released The King of Anxiety EP. Despite the title, Petite Noir sounded fully formed with a brimming, bright confidence to boot. The King of Anxiety wasn’t just a sampler platter of future sounds, it was an excellent release in its own right, filled with beautifully crafted singles like “Chess” and “Shadows”. La Vie Est Belle / Life is Beautiful refuses to reuse most of the work from The King of Anxiety which seems like a foolhardy move on the surface, after all, why wouldn’t you want more people listening to “Shadows”? but Ilunga is full of hooks, riffs, and more rattling percussion than you can shake a stick at. Make no mistake, along with Shamir’s Ratchet, this is one of 2015’s finest pop gems. Speaking of Shamir, the heavenly voiced Las Vegas native might be one of the few artists in Ilunga’s league. That does come down to an ear for shimmering production, but, more importantly, both of them have two of the most distinct and hypnotizing voices in recent memory. That breaks down into two parts: the first is just their registers. While Shamir has the angelic pipes of a choir boy lost in the clouds, Ilunga’s range is much wider and darker. His natural baritone is on full display throughout La Vie Est Belle, moaning and lurching right along with the rhythms, working with lust and dread in equal amounts. But there are the sudden bursts of light, when Ilunga reveals a stunning vocal range, best shown on lead single “Best” where Ilunga’s cry of “Please just go back home!” is punctuated by booming drums. There’s also the fact that Ilunga’s murky storytelling and narrative voice can wade into the otherworldly. “Freedom” rolls over a buzzing synth, and Ilunga’s voice could be called seductive, if tears and menace weren’t crawling into the chorus. It’s a delicious sort of cognitive dissonance that Ilunga milks for all its worth. Ilunga works with the same juxtaposition by the stark shifts in dynamic from verses to choruses. The soft verses lull you into a slight ease before the choruses shatter the previously created world. “Seventeen (Stay)” is the best example, with Ilunga’s sweet duet with himself on the verse erupting into a haunting chorus, laden with echoing synths and his own piercing cry. The most overlooked aspect of La Vie Est Belle will likely be the percussion, but it can’t be overstated how important it is to the Noirwave sound. Every track, even the downtempo cuts, bounces with energy thanks to buoyant drum combinations. Take away the synths, the guitars, even Ilunga’s voice, and there’s still a fiery presence in the pouncing drum work. This even carries over to the delightful, near trip-hop tendencies on La Vie Est Belle. The title track is the most overt when wearing this influence. A swaying guitar lead dances with a piano chime as Ilunga’s sleepy voice drifts in and out. There’s also a surprise rap verse from Ilunga cohort Baloji, exemplifying how flexible noirwave can be. Closer “Chess” is recycled from The King of Anxiety and for a good reason. It’s still a perfect introduction into Ilunga’s world and one of his most gorgeously weird tracks. His husky falsetto grooving over a slowly growing guitar riff eventually evolves into fireworks, crossing the territory from rock, pop, synth, and a billion other elements: noirwave in a six-minute nutshell. It’s easy to mistake Ilunga for a veteran pop-maestro, but there are a few missteps that reveal his relative youth. The sappy sentiment of “Just Breathe” (“be the change you want to see”) feels a bit too sugary for Ilunga’s well-honed gloom and “MDR” straight-up rips off “You’re the One that I Want” from Grease. Even “Just Breathe” seemed situated in Ilunga’s world, but “MDR” is an unwanted transmission from reality on an extraordinary trip into another dimension. These are minor nitpicks however. Ilunga might just have the Midas ear, and it wouldn’t be surprising to see pop stars lining up at his door, demanding his deft hand guiding their next top 40 hit. Then again, Ilunga might refuse and blaze his own path to dominance. Considering La Vie Est Belle is his first major foray, it would be surprising if he doesn’t assert himself as a pop force.